From master storyteller John Grisham and the director of Don't Say A Word comes a taut suspense-thriller that grabs hold of you, and never lets go. When a young widow in New Orleans brings a civil suit against the powerful corporate consortium she holds responsible for her husband's murder, she sets in motion a multi-million dollar case. It's a suit that may be won even before it begins however, based solely on the selection, manipulation, and ultimately, the attempted "theft" of the jury. With lives and millions of dollars at stake, the fixer plays a deadly cat-and-mouse game with a jury member (John Cusack) and a mysterious woman (Rachel Weisz) who offer to "deliver" the verdict to the highest bidder. Academy Award winner Dustin Hoffman stars as idealistic prosecutor Wendell Rohr, and Gene Hackman takes on the role of ruthless jury consultant Rankin Fitch. Packed with danger, intrigue and pulse-pounding twists and turns, Runaway Jury rules! 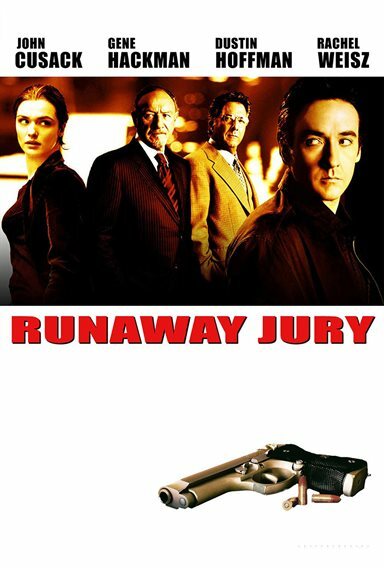 Download Runaway Jury in Digital HD from the iTunes store. Runaway Jury images are © 20th Century Fox. All Rights Reserved.